That day is not far away when you sit in a cinema hall and you can easily talk to your friends without disturbing other viewers sitting side by side. 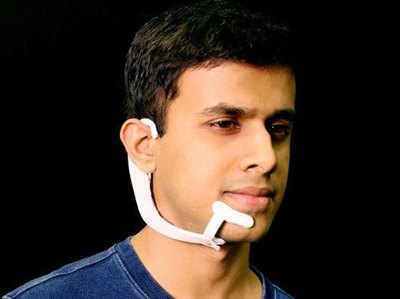 A researcher from the Massachusetts Institute of Technology (MIT), who is of Indian origin, has developed a device through which you will be able to hear other words without your voice, which will be running in your mind at that time. The name of this Indian-origin researcher is Aranav Kapoor who has made a headset named AlterEgo but it is not a scary or strange minded device. The website of the MIT Media Lab has made this thing clear, 'This device can not read your mind ... This system has no direct connection or physical connection to your brain activity, and this is why this device will be used for your thoughts Can not read '. Therefore, those concerned about their privacy need not be bothered anymore. AlterEgo runs on the basis of subvocalization. Every time you say a word in your brain, then there are very small and invisible movements in your jaw that are called subvocalizations. Whenever a person tries to speak a word or sentence internally, the electrical momentum on the surface of the skin on the lower side of the face and neck towards the neck, the device is worn like a headset reads the same momentum. is. Once this device grabs the signal, after which a computer has been trained for the same thing that it changes these signals into words, it starts working. But AlterEgo does not send the word to the person listening to the sound through sound waves present in the air. Rather than leaving the sound to vibrate in the air, this vibration is delivered to the listener's jaw through a direct contact. These types of headsets have been using the armies of many countries for years, and now some companies have started selling them as a lifestyle gadget. The advantage of this technology is that without it voice communication can be easily done through it. For example, on the floor of a very fretful factory or on a deck of aircraft carrier, where there is a lot of noise, it can be easily discussed without screaming and without hurting the throat. However, AlterEgo's success depends on how accurately the device is able to translate the vibration into words. At present, Kapoor and his team boast 92% accuracy and display only a little less than Google's voice transcription device. Although Kapoor claims that this system will come in contact with the new methods of vibration and words, its performance will be improved.